It’s hard to believe we are almost half way through the season! 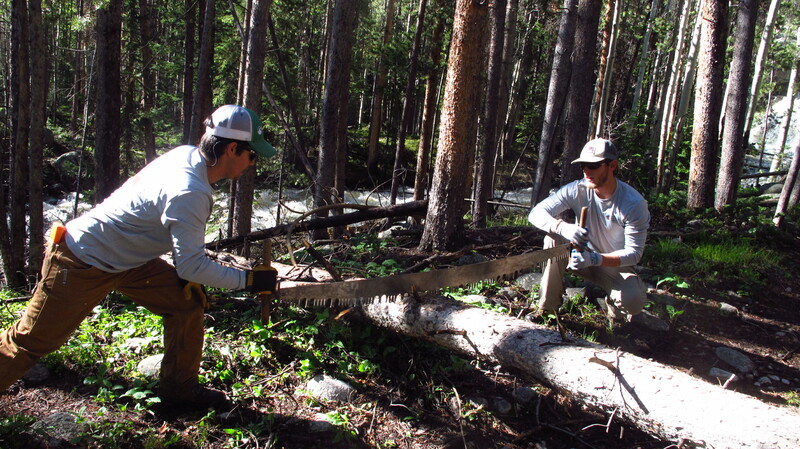 With the third week in the field coming to an end, check out where the Rocky Mountain Conservancy Conservation Corps has been this past week directly from some crew members. This week, the Shadow Mountain Crew cranked out many projects at a variety of venues. We started out on Wednesday, pouring concrete bases for bear bins at the St. Louis Campground near Winter Park. It was a refreshing break from trail work to play around with cement for a morning. Later in the day, we headed to the Twin Bridges Trail where a logjam in the adjacent river had managed to completely wash out a section of trail, including a turnpike. We spent Wednesday afternoon and a long Thursday diverting the river (which was somewhat difficult since rivers tend to do what they want. ), harvesting rocks from the forest to fill in the turnpike, and then covering the newly stabilized trail with fresh dirt. The end result was a fabulously solid path for mountain bikers, half-marathoners, and hikers. 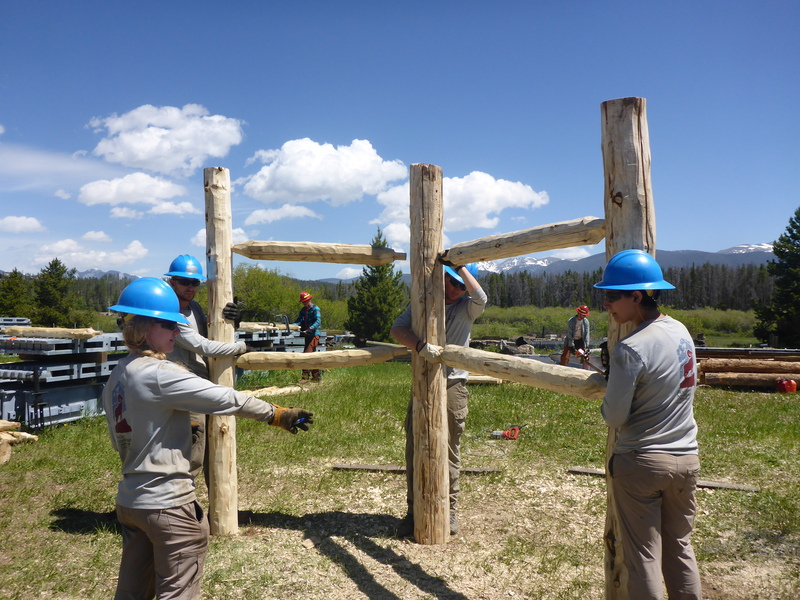 Our next task of the week was to make large kiosks for district trailheads. 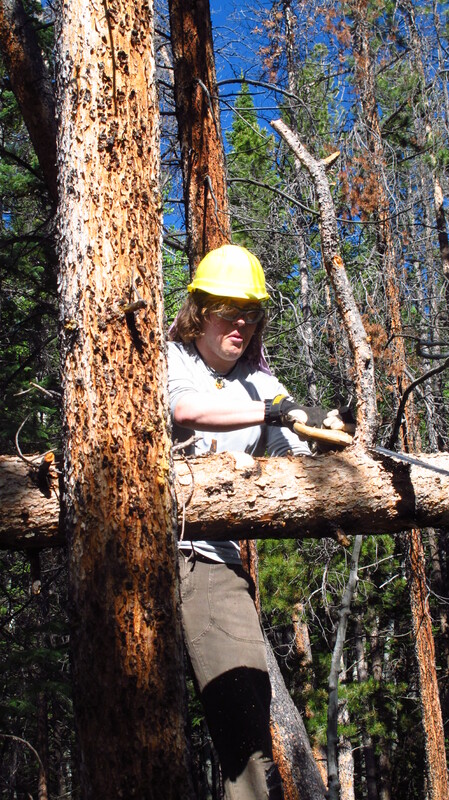 We started out in the Shadow Mountain village with 6 other forest service workers with a large pile of logs which we then skinned and drilled holes for smaller cross-bar logs. It was a battle royale, but the Shadow Mountain crew managed to wrangle the unruly logs into 8 2-panel kiosks and 2 4-panel kiosks. 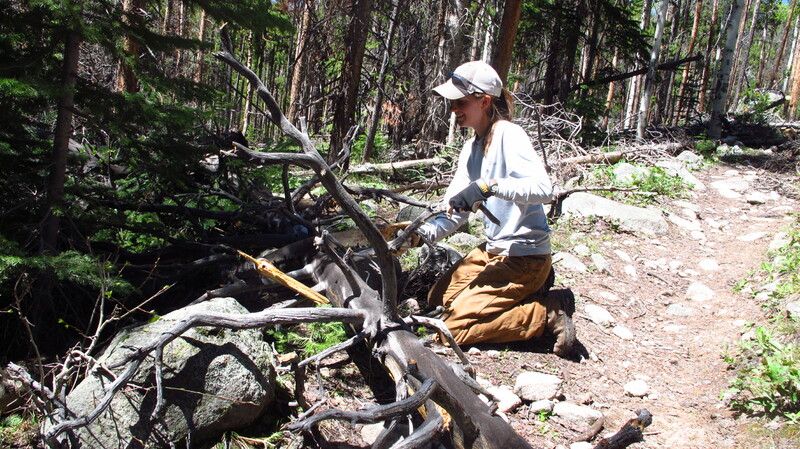 Skinning logs to be used for trail kiosks. 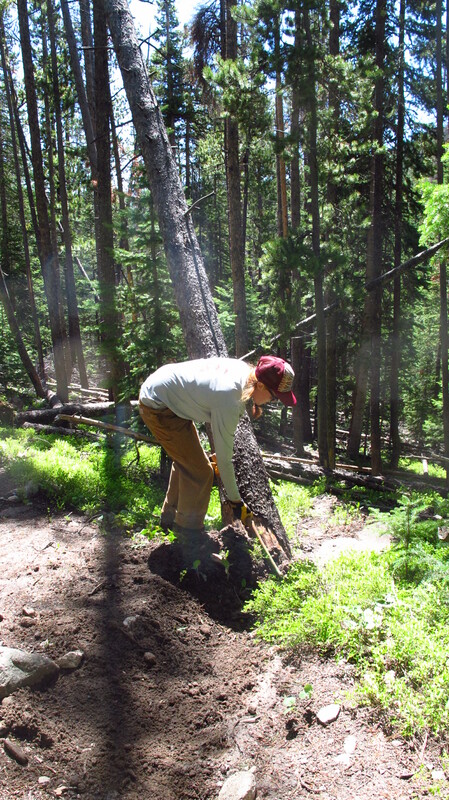 The Red Feather Crew has plunged into yet another week of trekking through rugged wilderness, repairing trails that have been damaged by flooding and carving out new routes to prepare for future hikers. As a crew we are bonding in many ways, from listening to hilarious podcasts of the NPR radio show “Wait Wait…. Don’t Tell Me!”, to visiting the local libraries and restaurants of Fort Collins during leisure time. 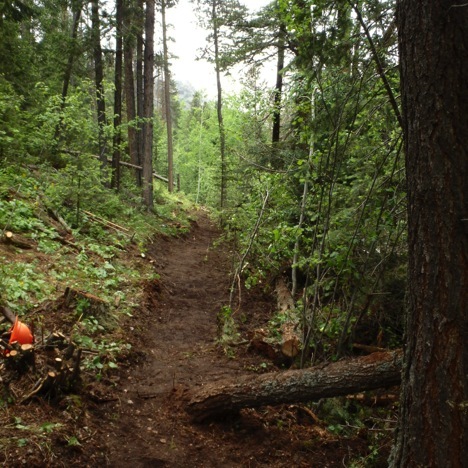 When we are not defending against the constant barrage of mosquitos on the trails, we have excavated hundreds of feet of new pathway, constructed at least at Lions Gulch Trail as well as Lilly Mountain Trail near Estes Park. 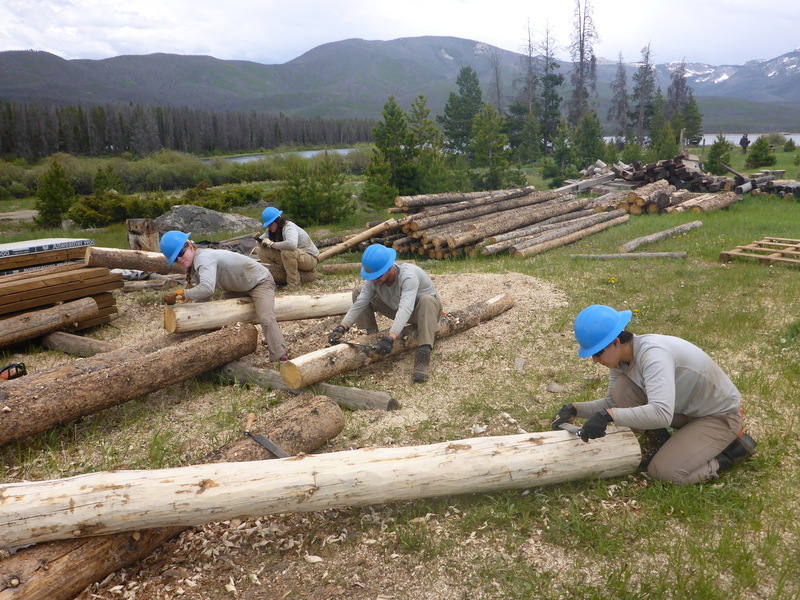 It has also been a pleasure to get to know the Laramie Conservation Corps, seeing as we have been working together these past couple of weeks. As a team we have already made a sizeable impact on major damages at Lions Gulch near Estes Park. It has been rigorous, but very fun work, and I enjoy getting to know the crew members more and more each day. It comes as a shock to think that midweek is the week after next. We can’t believe how time is flying by, but we already have made many wonderful memories that will remain with us for a long time. Rebecca, Clint, Mary, Michaela, and Joe are all very hard workers and we have all grown to understand the impact we can have on our natural surroundings. For those of us on the illustrious Boulder Crew, this week was pretty darn grand. We began on Wednesday with a full day of trail work on the Dry St. Vrain trail rerouting a section that had been damaged by the floods. On the way out we popped a tire and spent only a couple of hours changing it! Shout out to Jake for his ingenious use of duct tape. Seriously, an engineer in the making? Thursday, we rode into Boulder for the Boulder district meeting. We got to meet all sorts of Forest Service officers and enjoyed a potluck with them. 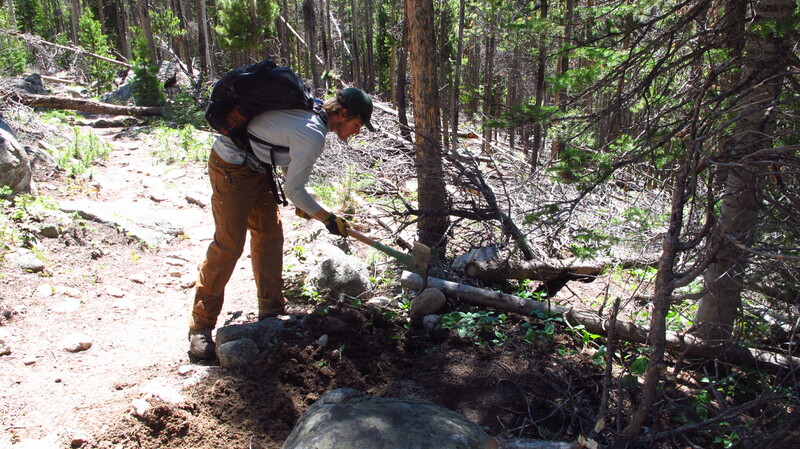 After that we headed up to the Sourdough Trail and dug some drains. Friday we headed back to the Dry St. Vrain and polished up the reroute. Joey, Danny, and Paul moved a huge rock—which was pretty exciting. Joey estimates that it weighed 507 pounds. After that we headed back to the Boulder Ranger District to set up for an Indian Peaks Wilderness Alliance training that we shadowed on Saturday. Overall, it was a great week because we got to learn a lot more about the Forest Service and all the people involved in the preservation work we’re so passionate about! 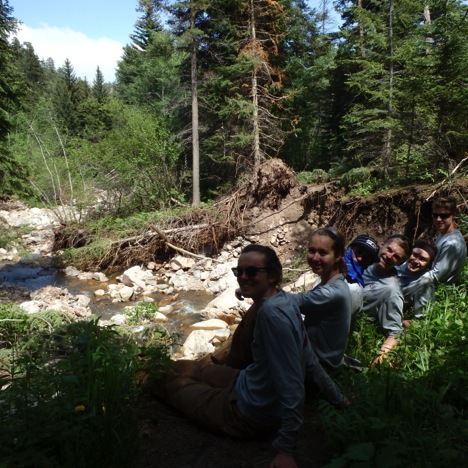 The Rawah Crew was back at it this week serving in the extensive Rawah Wilderness Area. On Monday, I was able to join the Rawah Crew on the Rawah Trail. 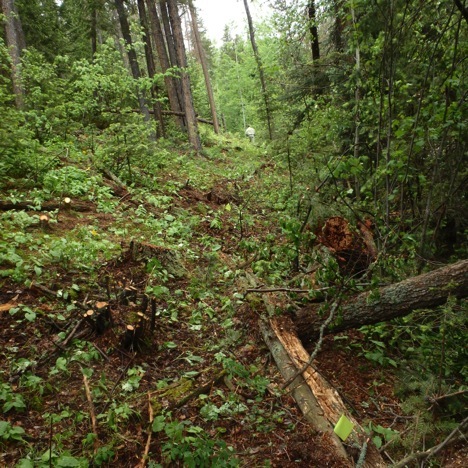 We completed three miles of trail to the USFS Standard which included upwards of 30 logouts and approximately 60 drains cleared. Patrick preparing to clear a snag. Michaela using the silky to clear smaller trees off the trail. Reid clearing a drain around downed trees. 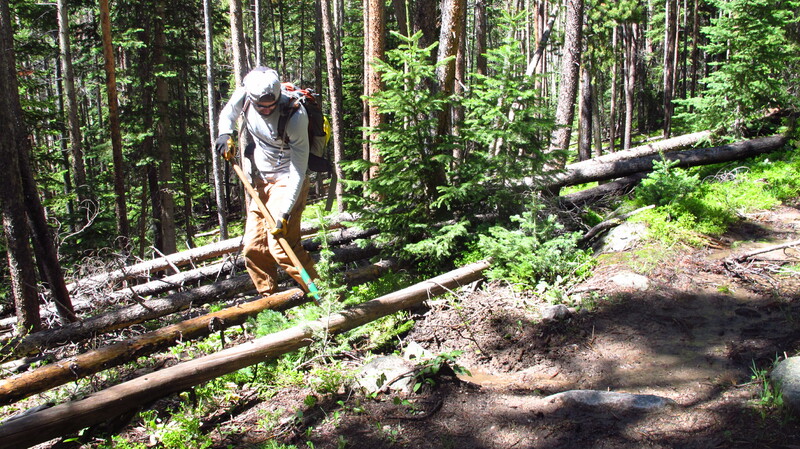 The rest of the week the crew worked to maintain the Big South Trail and the West Branch Trail. 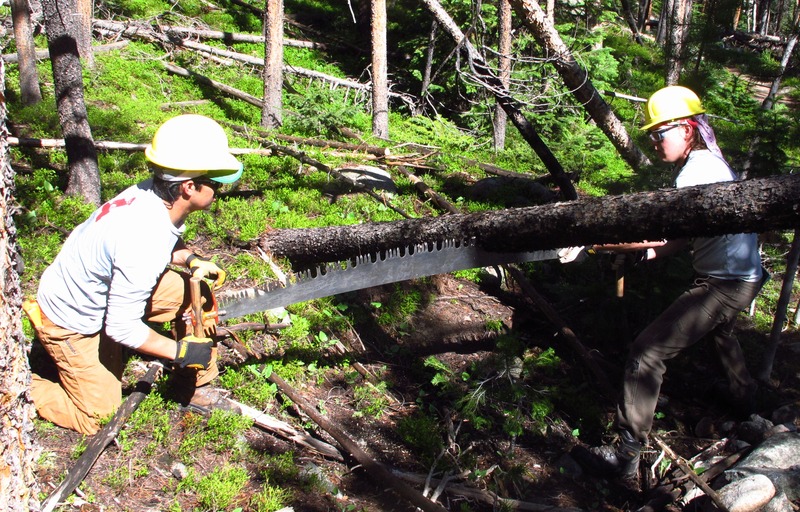 By the end of the week the crew maintained over ten miles of trail to USFS standard, which included over 100 log outs and nearly 200 drains cleared. The Estes Crew will be featured this week in the Crew Spotlight, updates from their work week will come tomorrow. We couldn’t be happier doing it. Thank YOU for exploring Colorado’s beautiful public lands and appreciating the work that goes into preserving them!